Ville Räty (b. 1980) is an artist who´s at home at the limits of the urban landscape. 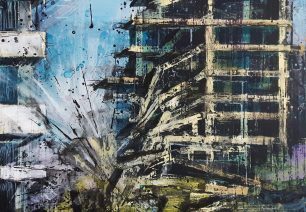 He paints in strong colours sceneries that are set on construction sites and abandoned, torn down buildings. 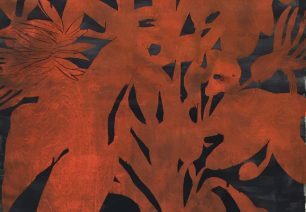 The ensemble is dominated by a surface that is bordering on abstract, where his trace is accentuated by repetition that has been done with the aid of a stencil or the monotype method. The inspirations drawn from apocalyptic comics and films are enjoyably visual. The exhibition will be open from March 3rd till April 2nd. Welcome to the opening party on Thursday, March 2nd from 17h00 to 19h00! Noora Nio-Juss (1976) has graduated as an artist from the Estonian Academy of Arts in Tallinn, and as Master of Arts from the Academy of Fine Arts. Last year she participated in the Kuvan Kevät MFA Degree Show. Nio-Juss is generally known as a painter, but in recent years she has done a lot of impressive woodcuts. These big, rough artworks are seemingly random details from our surrounding. They have lost their original meaning and have become symbols. the narrative is simplified into fragments and the form becomes the leading factor. Nio-Juss is an expert in creating graphic tensions in generous size. Her way of working differs from the methodology generally applied to graphics by shifting into a more expressive direction. The result is intensely direct and honest. The exhibition will be open from February 8th till March 5th at the ARTag Gallery Studio. Welcome to the opening party on Tuesday, February 7th from 17h00 to 19h00!